A new 2015 Subaru WRX was caught testing in California on a twisty section of road east of Malibu recently. Is this the new WRX and WRX STI design? On an ideal section of highway near Malibu, California, a new 2015 Subaru WRX test mule was caught testing on the twisty Mulholland Highway. The video was captured by YouTube user 31200MulhollandHwy, and that is also the location of the section of road where the new WRX is seen running through the tight corners. 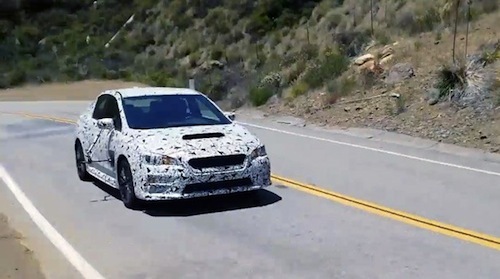 The user says the road was intermittently closed by the California State Patrol so the Japanese crew could put the new WRX through its paces. But is this the new design of the WRX Concept that we saw unveiled in New York? We know the next-generation WRX and WRX STI will feature something similar to the WRX Concept car. The car in the video of course is camouflaged and its difficult to see every detail. But Subaru has been known to be fairly conservative in their approach to new designs and will likely not get too radical in its design language of the new WRX. The new WRX will move the brand forward in styling that will incorporate both current Subaru family features and new designs not seen before. The WRX Concept does tell us a few things about Subaru’s intentions of performance. The new WRX Concept gives us a hint of the coming power with the hood intake and the central bumper that are vital in representing the “sure-fire turbo performance” that will be available. The WRX has always represented stability because of the low center of gravity, and the grille and headlights are now more lengthy and protracted, which reinforce the pulled-back design and implied stability. The new 2015 WRX should be lighter and more agile than the previous generation. Subaru may use carbon fiber in the roof to reduce overall vehicle weight. The section of highway that the Japanese crew chose to test the new WRX is west of Agoura Hills and near the Santa Monica Mountain National Recreation area, and just down the road from Seminole Hot Springs. On this section of the Mulholland Highway, there are four very good switchbacks and tight corners in which to do some great performance testing. There are also enough strait sections to reach high speeds. The test car can be seen and heard well as the driver pushes the new WRX hard in the corners. Performance fans can count on Subaru to bring the next-generation WRX with even more power and performance than before. Look for a new turbocharged intercooled engine with more power, a lighter more agile WRX STI with carbon fiber body panels, and improved handling from a tuned chassis. Subaru will also provide more grip in the corners as seen in the video with an improved Subaru Symmetrical all-wheel-drive system. If you are a fan of performance, there is much to be excited about with the new 2015 Subaru WRX and WRX STI. Watch the Subaru WRX car testing in California video.